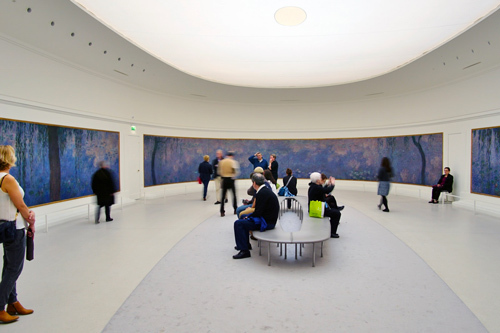 Visit the Orangerie Museum in Paris with tickets that enable you to jump the queues. Immerse yourself in discovering the works of the father of Impressionism, Claude Monet, along with many other famous artists. In this musuem, you will have the opportunity to admire the impressionist and post-impressionist works of Cézanne, Matisse, Picasso, Renoir and Rousseau in the tranquil setting of a museum that is nestled in the Tuileries Gardens. The father of impressionism, Claude Monet, donated to the French state his collection of "Water Lilies", large floral panels of immense beauty. The only thing that Monet requested in return was regarding the care that should be taken in the choice of where to house them and how they should be hung. Monet confirmed that the historic gardens of the "Orangerie" inside the Tuileries Gardens was an ideal location and he himself chose the layout of his works which has remained in the same arrangement more or less unchanged up to the present day. No restrictions on entry times so you can visit at whatever time you like. The museum contains a very large collection of works by the most important exponents of impressionism and post-impressionism. Undoubtedly Claude Monet's works are those which command the most attention and also occupy the most space in the building. In fact, the entire collection of Monet's Nymphéas consists of 8 large panels that are considered to be amongst the best representations of the impressionist movement. However, in addition to the works by Monet, you will also find masterpieces such as: "Turkey and Tomatoes" by Souline, "Still Life with Milk Jug and Fruit" by Cézanne, the series of Odalisques by Matisse and "Bathers" by Picasso. The paintings referred to here are a fundamental reference point in contemporary classical art and the museum looks forward to welcoming many more pictures to its collection. On the day of your visit, just show your tickets on your smartphone and Jump the Queue using the preferential access lane. The Museum is open every day from 09:00 to 18:00, except Tuesdays when it is closed all day. The Orangerie Museum is located inside the Tuileries Gardens just a stone's throw from Place de la Concorde and also very close to the utterly delightful Musée d'Orsay. If you fancy a stroll, it is really easy to walk from the Champs Elysées or from the Louvre, the distance is around 10 minutes from both places. In order to get straight to the museum, you can take the metro (Lines 1, 2 and 8) and get off at the Concorde stop. Go across the square and you will come in to the gardens via the entrance on Place Concorde where you will find the building directly to your right. Or, if you are real fresh air fans and like bike rides, why not come on a city bike from the Velib stations at rue Cambon 2 or rue de Lille 112?